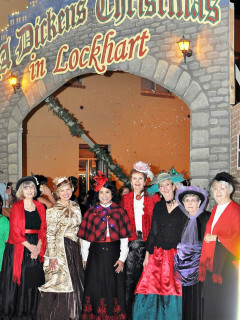 For the past 29 years, a Dickens Christmas in Lockhart has joyfully welcomed the holiday season. The community-wide event for families will kick off with the a lighted parade on the courthouse square on Friday night. The celebration continues on Saturday with food, arts & crafts vendors, and free family friendly activities and entertainment, including Father Christmas, hay rides, and ice sculptor, jugglers, and more. The evening ends with the lighting of the yule log and a proclamation that Christmas has come to light. The library and the historic downtown will be lit with thousands of lights.